Kaljaja is the medieval fortress in Prizren dating from 11th century, in which once the capital of Serbian Empire was located. It was built on a hill above the Bistrica River, around which the modern city developed. The first fort, erected on this location by the Byzantines, was further expanded by Tsar Stefan Uroš IV Dušan of Serbia. The fort then came under the Ottomans, who controlled it for four and a half centuries, giving it its modern shape. The fort is now in ruins, but still can be see its monumentality, although it is difficult to discern the outlines of the original medieval town and the number of Towers due to later expansion. It's sure worth to climb up the Podkaljaja quarter to reach the fortress as it pays back with a wonderful panoramic view of the city of Prizren, the Bistrica Valley and the surroundings. 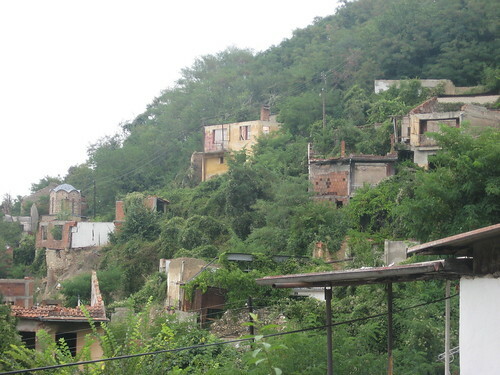 As beatuful and charming the city of Prizren might be...there is however a black sopt that disturbs the eye of the tourist: the former Serbian district of Podkaljaja. 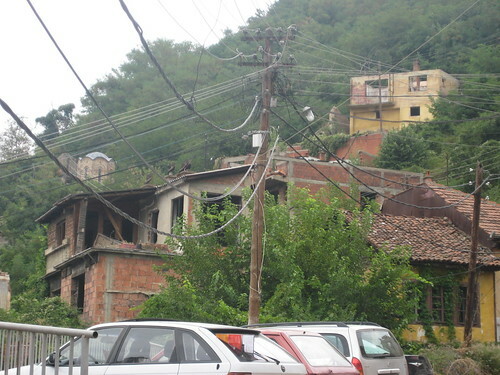 In March 17th of 2004 some rioting albanian terrorist destroyed and devastated the serbian district of Podkaljaja (lit. 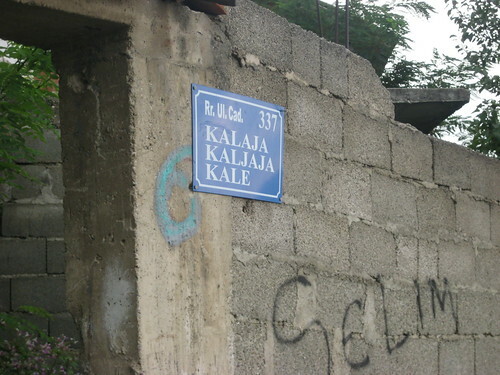 the district under the Kaljaja). Moderate Albanian leader condemmend the actions of those extremistes. What you see in these pictures happened in "peace" time when KFOR was controlling the territory. Walking up to the fortress you walk by a Churche controlled by German KFOR and warning signs everywhere. 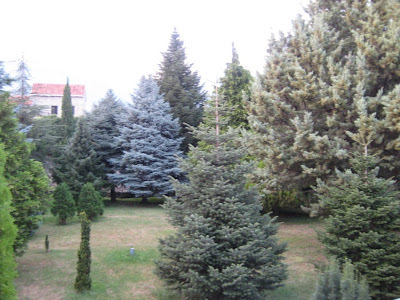 The endowment of landowner Mladen Vladojevic with his parents, at the time of Tsar Dusan's rule, was built around 1330 and in 1348 given as a gift to the nearby monastery of Holy Archangels. 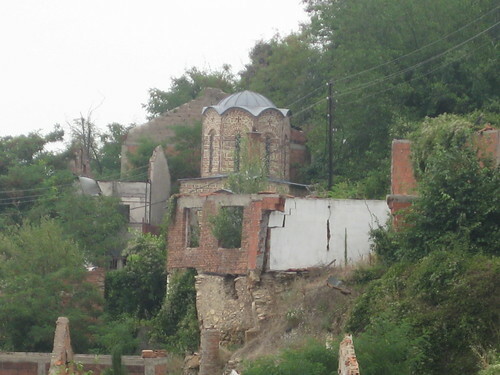 The Vlach community in Prizren, which had the right to use this little church from the second half of the 18th century, built, in 1836, high walls of a future shrine which was never completed and the church of St. Spasa thus became only a part of its northern nave. The medieval church is of small dimensions, with the foundation in the shape of the shortened cross with octangular dome and the apse three-sided from outside. It was decoratively built with neat alternate layers of limestone and brick and with ceramoplastic ornaments. The paintings were painted in two phases: firstly in the altar around 1335 and the paintings are of poorer quality and then in the rest of the church until 1348 when a part of the altar area was repainted. 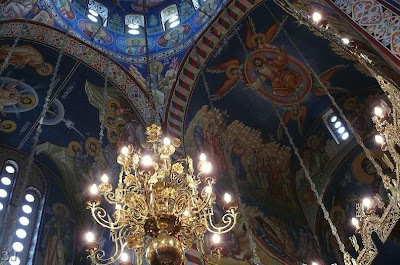 The original paintings on the altar were painted by one painter, a member of the workshop which also painted the church of St. Nikola, endowment of Dragoslav Tutic. Small dimensioned frescoes from the second phase were painted by local painters educated by the good traditions of the Byzantine art who had a sure and prominent drawing. A third painter painted Christ and the Virgin Paraklisa in priprata most probably after 1348. The paintings were greatly damaged and a fire in the 19th century changed their palette. Conservation works on architecture and frescoes were carried out in the 1953-1963 period. 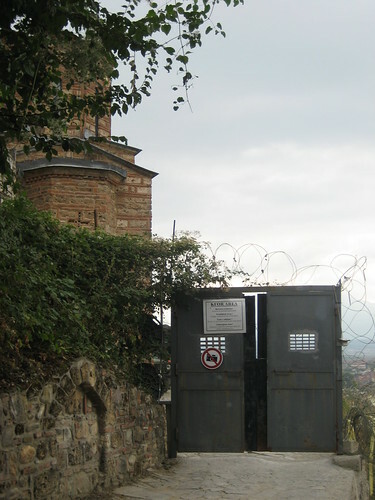 After the Kosovo war 1998-1999 St. Savior church is under constant guard by German KFOR troops. It's not possible for now to visit the ruins. 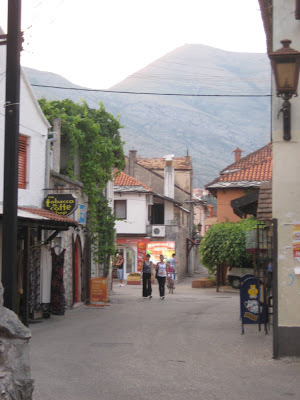 Next to the Maraš Mahala (from the last post) is another old district of Prizren that gives to this city a charming atmosphere: the Šadervan Mahala. Theoretically Mosques and Churches stands here next to another and there are big efforts to convince that Prizren is a multi-ethnic city. The reality is far away from that! What concernes the multi-ethnicity here some numbers from 2007 (from wikipedia): The population of 171'464 inhabitants is composed of: 81,6 % Albanians, 9,6 % Bosniaks, 6,4 % Turks, 2,3 % Roma und 0,09 % Serbs. It makes 94% Muslims. And to be honest, if you wanna get treated friendly by the locals (and they are friendly, no doubts) DON'T SPEAK SERBIAN! 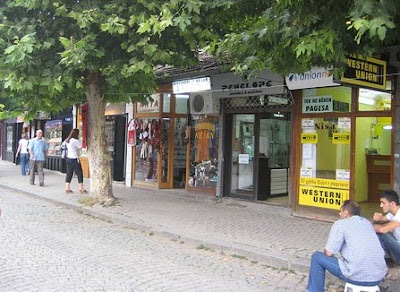 The old commercial center of Prizren is all around Šadervan Square so the district is called Šadervan Mahala. Along pedestrian cobblestone streets are shops, coffee places, bars and restaurants. The entrance to the Šadervan Mahala crossing the bridge over Bistrica River. On the right is the Sinan Paša Mosque and in the background the older houses that in the center are all just 2-storey high and in earth tinted colors. Most of the houses however are recently built and there aren't almost any old houses anymore. The Sinan Paša Mosque one of the main landmarks of Prizren. The mosque, according to inscriptions, was built in 1615. 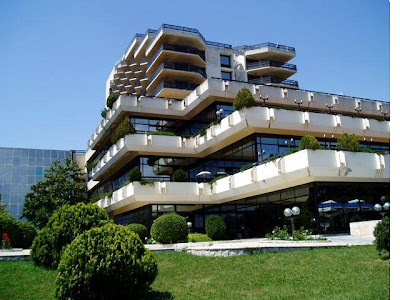 Thanks to its position and elegant proportions, it dominates over the surrounding part of the town. The enormous dome is fitted harmoniously into the square mass of the building. The interior of the mosque is decorated with geometrical designs, still life, and draperies, while the other parts of the walls are painted in strong light colors. 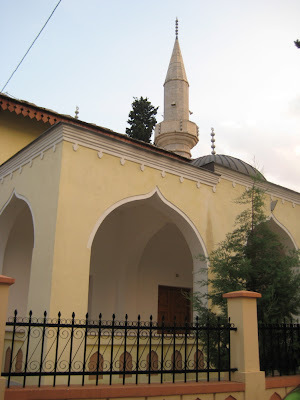 The mosque dates from the ottoman (turkish) occupation in Prizren. 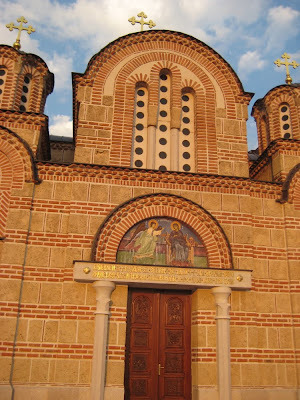 The Serbian orthodox church of St Nicholas in the very center of Prizren's Šadervan Mahala dates from 1332. 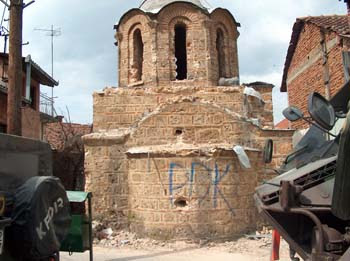 Despite the presence of the German KFOR troops in Prizren, the church was attacked by Albanian terrorists and devastated not during the war but in "peace" times! 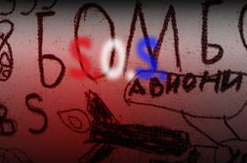 Above a picture from TANJUG shortly after the attacks. Today the church is protected by wooden wall. The PDK means Democratic Party of Kosovo. Over the Bistrica River are several old bridges that connect the old districts Maraš and Šadervan with the newer part of the city. 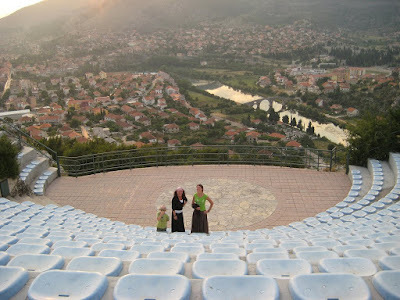 In the next few post I'll put a series of pictures of an extraordinary city in southern Metohija: the city of Prizren. 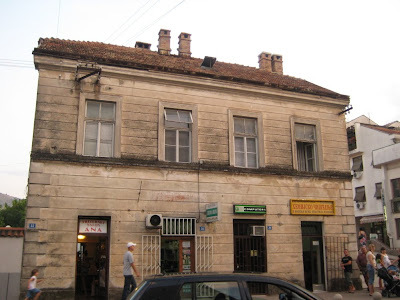 Here a few pictures of Maraš Mahala an old district that should be preserved. 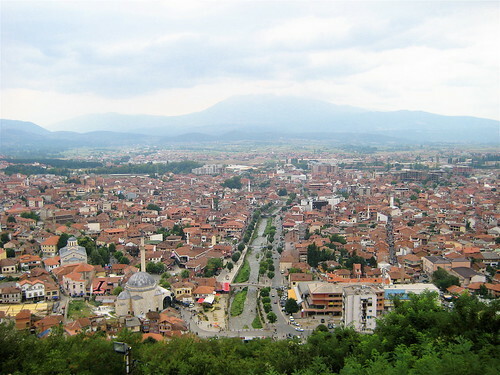 Already known in roman times as the city of Teranda, Prizren was developed between 6th and 9th centuries and can be considered the historical and cultural capital of the Kosovo and Metohija region. After 830 it belonged to the Bulgarian Empire, Byzantin Empire and Serbian Empire. During the 14th century Serb Emperor Dušan raised the city to an important trading and cultural center that was called Serbian Constantinople. During the Turkish reign from 1460 to 1912 the town on the river Bistrica develops a new urban structure by shaping its center (carsi) and quarters (mahala) and with constructing monumental Ottoman edifices. Situated in the bend of the river Bistrica, the Maraš area has kept a village identity with its Maksut Paša Mosque, its cemetery, its mill (recently destroyed) and its fountains. 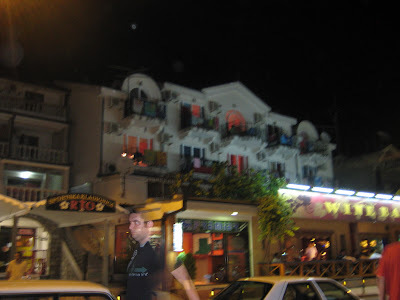 The houses in Prizren belong to the Balkan traditional style of a ground and oreal first floor buildings with carved ceilings, facades painted in bright colours, with neatly arranged gardens and cobblestoned patios through which water gutters passed. 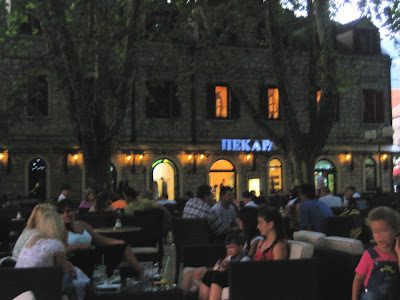 Here a newer part of Maraš area where a river side walk leads to recrational area at the Bistrica River following a line of bars and coffee shops. 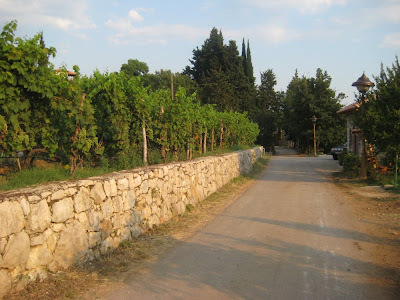 On the way between Trebinje and Mostar (around 5km from Trebinje) lays an old monastery surrounded by wineyards. The monastery was built on the foundation of an old church, and the 4th-century foundations of the first Roman church on the site are still visible today (inside the curch, below the glassbottom). This shows also how long there is christian religion in Hercegovina. 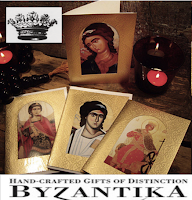 In the first half of the 6th century the monastery was the biggest scriptorium of the Slavic south, and at the same time cultural and spiritual center of a broader area. The Orthodox monastery was established there in the 15th century, with a cathedral constructed about 1508 and painted with murals by Vicko Lavrov from Dubrovnik (1517) and from monk Marko Stefanov Trebinjac (on the same period). This was also the period when Viasilije Ostroski (the holy monk from Ostrog Moanstery in Montenegro) arrived to Tvrdos to become a monk. His modesty forbidding him to push himself forward to occupy the high positions his piety and capabilities recommended him for, he was elected as Bishop of Zahumlje and Skenderia against his will. He had the capacity to help the orthodox population of the area not to succomb to islamisation by the turks or to catholization by catholic missionars. 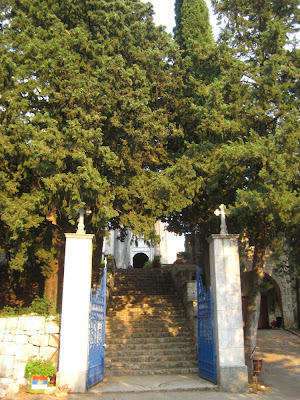 The monastery remained a seat of the Metropolitans of Herzegovina until the Ottoman Turks destroyed it in 1694 (in the fights between Venetians and Turks). That was also when Vasilije Ostroski fled to Montenegro. Actually Tvrdos had been frequently destroyed and reconstructed before. 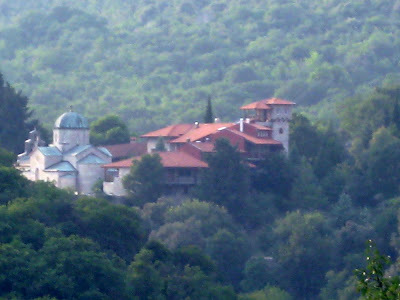 The current building of the monastery was constructed in 1924. 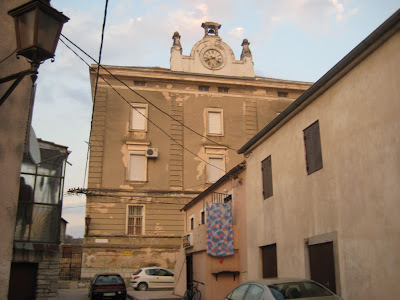 Today the monastery is temporarily the seat of the Eparchy of Zahumlje and Herzegovina (otherways the seat is in Mostar). Tvrdos was built to give protection from attacks, a massive wall is built around the monastery. The monastery is also known for the good wine the monks are making and also for the honey. 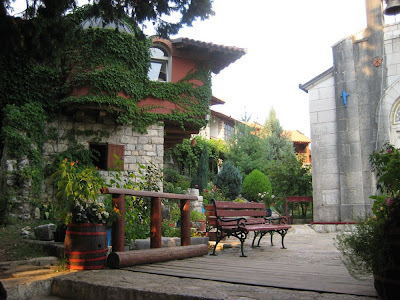 Because of that it's on the wineroute of Hercegovina (here the site) and here is the website of the monastery (in serbian). 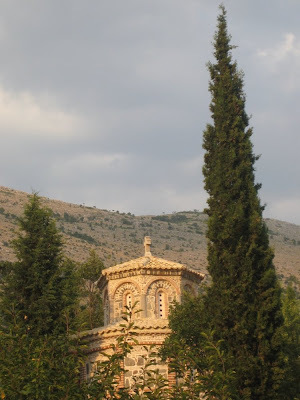 From the city center of Trebinje, there is a 2 km road that winds up the hill Crkvina where you reach the church "Hercegovacka Gracanica" (the Gracanica of Hercegovina) a copy of the famous Gracanica Church in Kosovo and Metohija (here the post I made). 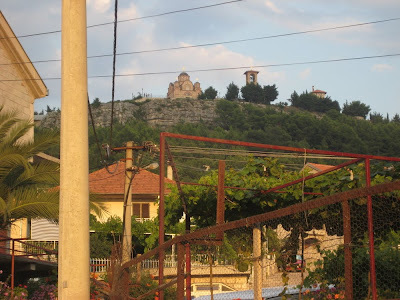 On the top of this hills there was already a christian church (probably from 6th century) in the place where now stands the new Gracanica. The famous serbian poet Jovan Ducic (1871-1943) is burried there. When he died on April 7, 1943 he was buried in the Serbian Orthodox monastery of Saint Sava in Libertyville, Illinois (USA). 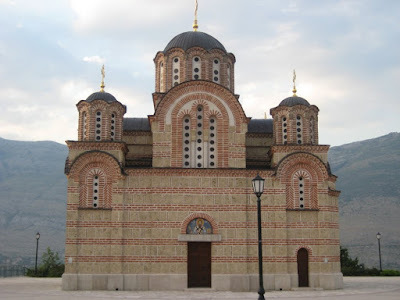 He expressed a wish in his will to be buried in his home town of Trebinje, a goal which was finally realised when he was reburied here on October 22, 2000 in the newly built church. And so the grave of Ducic is now in the krypta of the Church. The church can be seen from any place in the town of Trebinje, and it is said to be the most beautiful sacred place in Eastern Herzegovina. 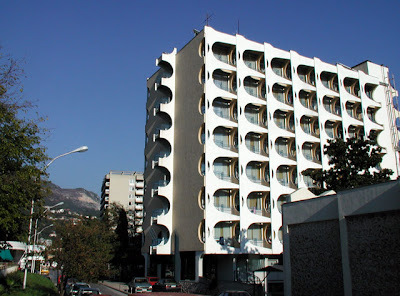 For the building, the Church got a very generous donation from one of the richest Diaspora Serbs: Branko Tupanjac. What made me smile a little is this fresko, it shows Jovan Ducic (for whom the church was built) and Branko Tupanjac (the sponsor) handling over a church building. The Church Complex includes an amphitheater, the Vladicin (Bishop's) home, a gallery with icons, a summer garden, a library and a belltower. 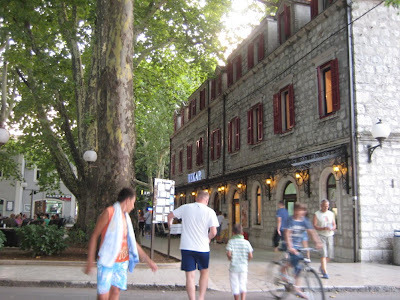 While spending some of my summer vacation at the Montenegro coast, I made a daytrip to explore some parts of Hercegovina, not far away from the Montenegro and the croatian order. 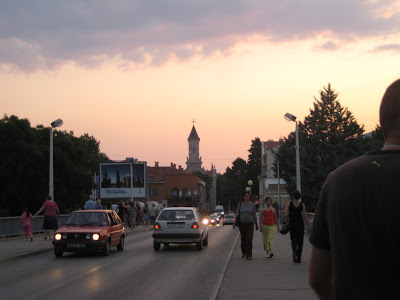 The toponym Trebinje comes from a medieval term Travunia. 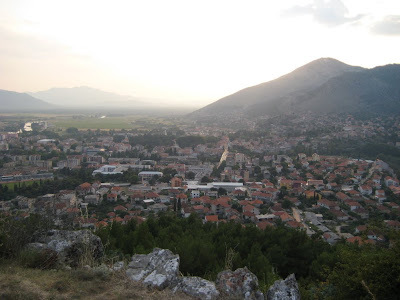 Trebinje was probably built by Slavs on the site of a Roman town laid waste by the Saracens in 840. In the mid-10th century Constantine Porphyrogenitus mentioned it under the name of Terbunia. It commanded the road from Ragusa to Constantinople, Under the name of Tribunia or Travunja (the Trebigne of the Ragusans), it belonged to the Serbian Empire until 1355. 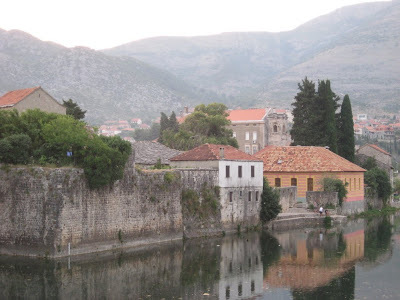 Trebinje became a part of the expanded Medieval Bosnian stateTvrtko I in 1373. In 1482, together with the rest of Herzegovina it was conquered by the Ottoman Empire. 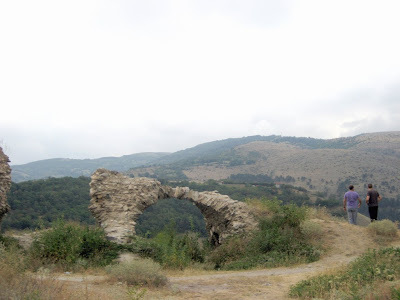 The Arslanagica Bridge was built by Mehmed-pasa Sokolovic in 1574, during Turkish occupation. It has been his pious endowment to his son who was killed in fights with Venetians. 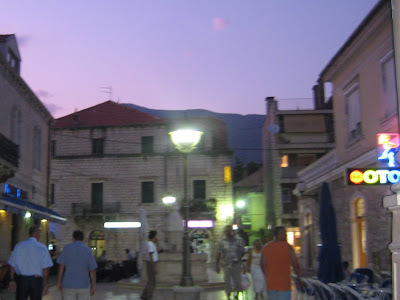 When Turks were pushed out of Herceg Novi in 1687, many Turkish families from this town moved to Trebinje. Among them there was Arslan-aga. He got possessions in the east from Trebinje: on Zubci, Necvjece and Jasen, as well as the right to charge bridge-toll across the bridge on the Trebisnjica River. Since then, the bridge was named the Arslanagica Bridge after him. By building hydroelectric system on the Trebisnjica River, the bridge finished under water of storage lake in 1965. At the request of Institute for protection of monuments of culture, the bridge has been dismantled and moved down the river in 1966. 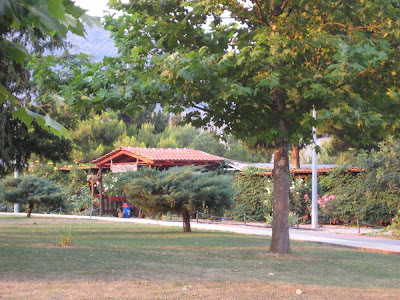 The new location of the Arslanagica Bridge has been between settlement Gradina (on the right shore of the river) and settlement Police (on the left shore). 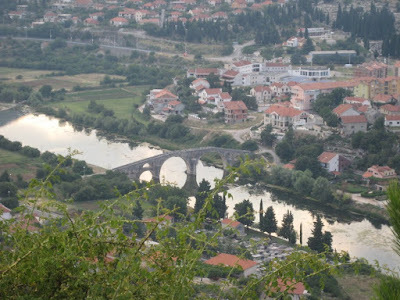 Since 1993, the bridge has also been called the Perovica Bridge. In the Old Town (Kastel)not far away from the westgate and town's walls, lays the Osman Pasa Mosque from 1726. The 16 meters high octagonal minaret was considered one of the most beautiful of Hercegovina and the mosque itself one of the most spacious. 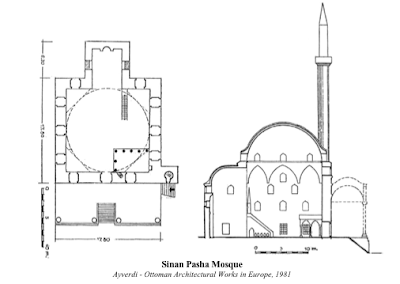 The mosque was built by masters of Dubrovnik and by order of Osman-Pasa Resulbegovic. After being destroyed in the last war it has been renovated authentic to the original one from 2001 to 2005. The old town is a lively place full with pleasant places and enough green spots. The architecture of the old town shows austro-hungarian influence. 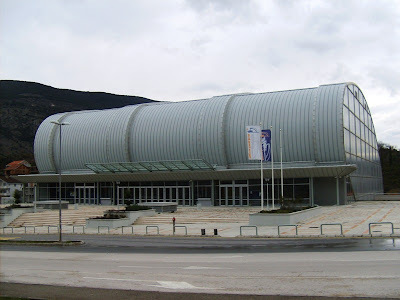 The town today is the economic, educational, cultural and spiritual center of East Herzegovina. 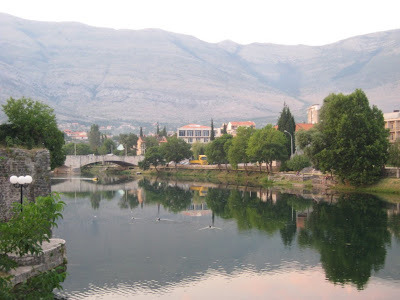 Trebinje simply captures ones attraction with its nicely cared urban line, and harmonious natural environment . 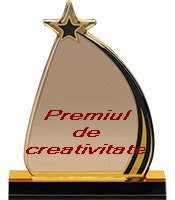 With its climate Trebinje is entirely opened toward Mediteranean Sea. The climate dominates over the valley of the Trebisnjica river. The river is heavily exploited for hydro-energy. After it passees through the Popovo polje area (South-West of the town), which always floods in winter, it naturally runs underground to the Adriatic Sea, near Dubrovnik in Croatia. The Old Town-Kastel was built by Turks on location of the medieval fortress of Ban Vir, on the western bank of the Trebisnjica River. 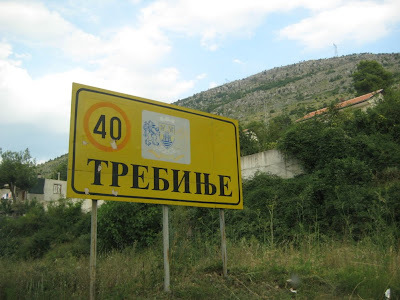 Trebinje strongly grew in the era of Tito's Socialist Federal Republic of Yugoslavia between 1945 and 1990. It especially developed its hydroelectric potential (Hydroelectricity) with its, dams, artificial lakes, tunnels, and several hydroelectric plants. 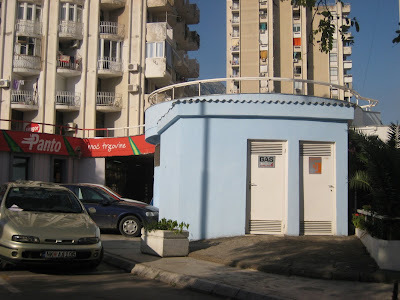 This industrial development brought large increase in urban population of Trebinje. 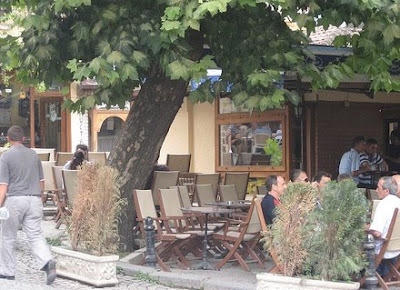 The old town is pedestrian zone and has many cozy places under the shades of big trees to dwell and and enjoy a drink! After crossing some parts of Croatia visiting Gomirje monastery (here), Krupa monastery (here), Krka Monastery (here) and driving throught ghost-villages (here) stopped on the montenegrin coast, just after the croatian border in a thermal spa place called Igalo. To be honest, Igalo is really nothing picturesque and lovely to look at, the reason for stopping here here was because my husband's relatives were spending their holidays here and so we enjoyed the time together in this place. Nevertheless, I could spot some interesting buildings even in this rather trivial place! 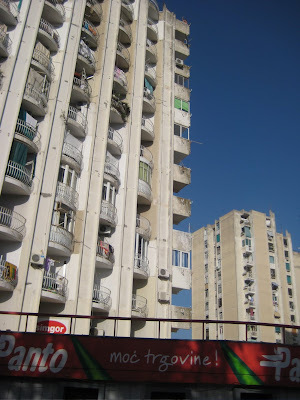 The first building to catch my atention was Hotel Centar in these pictures. 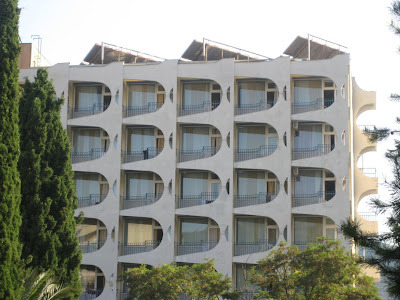 I really love this space-age inspired facades!!! ...I hope this hotel will mantain this look as long as possible!!! 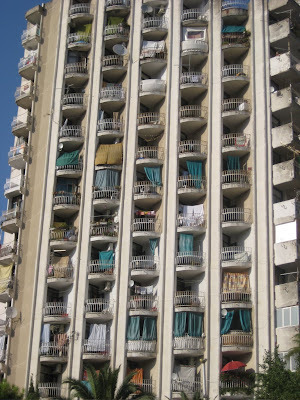 Walking to the beach, I always passed by these huge buildings. 14-storey skyscraper at the beach?! Yes, in Igalo! But if you look a them they are quiet lovely: with shell-shaped balconies and palm-tree garden around them. 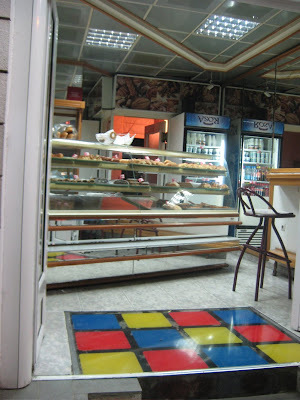 Entry of a backery shop inspired by saturday-night-fever. 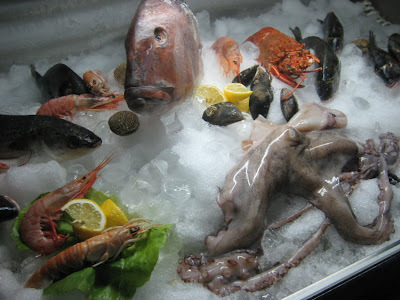 Arrangement of a sea-food buffet!! The construction of the second phase of the Institute implies three buildings - bays of the total area 64,000 m2, plus therapeutic, hotel and sports-recreational part. 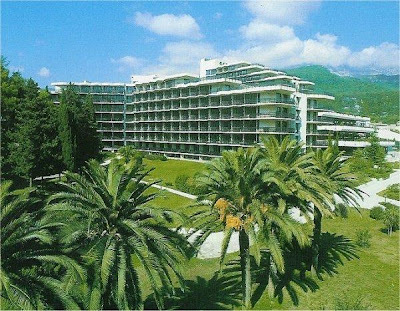 The therapeutic part with the ground floor and three floors has adequate pools, 48 rooms for different therapies, clinics for medical specialists, therapy premises, central pharmacy, laboratories, and swimming pools with sea and mineral water. 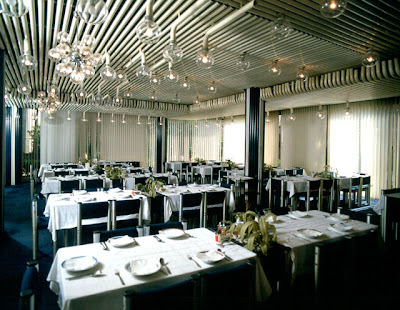 The hotel part has 900 rooms and suites for the patients. 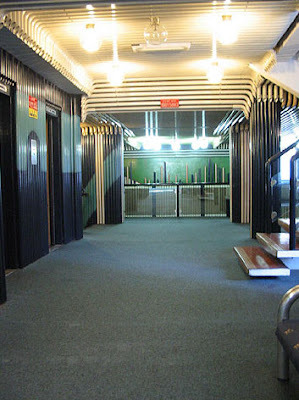 The building for social activities, sports and recreation has a restaurant with 3,000 seats, a seminar hall with 250 seats, a post office, a hairdressing shop, an indoor swimming pool, sports hall.